The same can’t be said for the next TKL mech I’ll be discussing below, the Max Keyboard Blackbird with blue ambient side lighting and Cherry MX Red linear switches. Continue reading to learn more about this high-quality TKL and determine whether the premium price is justified. The Max Keyboard Blackbird mechanical keyboard arrived at my doorstep bundled in a somewhat subdued art box. The front of the box includes a 3D rendering of the keyboard that details its measurements along with a few key features. Two stickers on the right side indicate this specific mechanical keyboard comes with Cherry MX Red linear switches and blue LED backlighting/ambient lights. The back has an actual picture of the keyboard, much more detailed specs, system requirements and package contents. The padding material could have been better. Basically just some cardboard and a thin foam bag to protect it during transit. Luckily mine was sent with plenty of bubble wrap in the shipping box. Though I don’t think it would matter too much, as this keyboard is much sturdier than I was expecting. Unboxing the Blackbird reveals the keyboard itself, manual/documentation, removable velcro cable tie and a padded wrist rest. No extra keycaps or a keycap puller tool, but the inclusion of a wrist rest more than makes up for that. The Max Keyboard Blackbird is a compact TKL (TenKeyLess form factor) mechanical keyboard. This type of keyboard is popular among PC gaming enthusiasts at it allows for more room for the mouse and a greater range of movement. It has a standard ANSI layout with 87 total keys. The keys are all industry standard sizes. Most replacement keysets and custom keycaps will be compatible. The Blackbird is hefty for a TKL, weighing in at 2 pounds 7.4 ounces (for reference, the Redragon TKL weighs 1 pound 10.9 ounces). It’s a beast. Measurements are 14.75 inches (length) by 6.5 inches (depth). The Blackbird has 6 multimedia keys located under the secondary Fn layer of the F1-F6 keys. F1 is mute, F2 lowers the volume, F3 raises the volume, F4 is play/pause, F5 is previous and F6 is next. There’s a LED sleep mode (up to 30 minutes) accessed with Fn + Scroll Lock and a timer notification profile (up to 120 minutes) under Fn + Escape. It includes a feature Max Keyboard calls “G Mode”, which lets you disable the Windows key. A vital feature for PC gaming. The Windows key lock is enabled/disabled by pressing Fn + F12. I’m also pleased to report they have installed a indicator LED that lights up when the lock is enabled. It’s located next to the Caps and Scroll lock indicator LEDs. The Blackbird supports both 6KRO and full NKRO over USB. You can toggle between each option using Fn + Home (6KRO) and Fn + End (NKRO). You may be wondering why they included the 6KRO option if it has NKRO. One reason could be because some motherboards have problems accessing and navigating BIOS settings while using NKRO. Switching to 6KRO will allow users to enter the BIOS and change settings using the keyboard. At the right rear of the Blackbird is a 2-port USB hub. The hub doesn’t supply much power. That’s why it doesn’t have a secondary USB connector on the cable that needs to be plugged into your PC. However, this limits what devices can be used with the hub. A red sticker comes taped over the USB ports warning that their max capacity is 100mA. It’s mainly for devices that use little power, such as flash drives and mice. Probably can’t be used for quickly charging your phone or accessing external hard drives (the power hungry spinning platter type, not SSD’s). Underneath we find 4 textured rubber feet for sitting the keyboard flat on a desk and 2 flip-out rubber feet if you prefer to type with a slight incline. These feet are superb. The flip-out riser feet have thick rubber inserts and snap into place with a satisfying click. No matter how you position the Blackbird it sits firmly in place. Some of that can be credited to the rubber feet, but the weight also helps secure it to the surface of a desk. The cable is braided and has a gold plated connector. It comes with a velcro cable tie already attached. It can be removed if you don’t need it. Unfortunately the cable is hardwired and not user replaceable. One of the few complaints I have about this mech. Probably not a huge issue for most users. For positioning the cable Max Keyboard has molded the bottom case with a cable gutter. It allows you to place the cable so it exits out the center, left or right side of the keyboard. A handy feature that all manufacturers should integrate into their boards. Visually the Blackbird is unique. It manages to implement a basic, minimalistic design with a small touch of flair from two blue ambient side lights. The clear panels on each side have a mesh insert that blocks some light to create a triangular pattern in the lighting. As flashy as the ambient lighting looks, the rest is extremely simplistic, almost businesslike. The top of the case is all black with no logos, badges or other marketing graphics to dirty the visual appeal. In fact, the only way you would know this isn’t a custom mechanical keyboard is the Max Keyboard “M” legend on the Windows key, which blends in fantastically. A great way to add branding without distracting from aesthetics while also giving users the option to remove their logo by replacing the keycap. The keyboard has angular edges in a couple of places. This design feature is most noticeable at the top (wedge shaped with small angular protrusions on each end) and the bottom (comes to a chisel shaped point). Looks will always come down to personal preference, but I’m a big fan of every design element Max Keyboard has chosen for the Blackbird. It’s a tough built keyboard that looks even more rugged than it feels in hand. Customization options for the Max Keyboard Blackbird are a bit limited. It’s available in three Cherry MX switch types (clicky Blue, linear Red and tactile Brown) with two choices of backlight color (blue and red). The settings for the backlight and ambient lighting are also pretty bare. There are three levels of brightness (low, medium and high) and a pulse mode. The lighting can also be turned off completely. This is all adjusted by holding down the Fn button and pressing Page Up (increase brightness, one level above max is the pulse mode) or Page Down (decrease brightness or turn off completely). The Blackbird allows you to record your own custom backlighting profile. This mode is enabled with Fn + Print Screen. When in record mode the three lock lights blink repeatedly to indicate it’s ready for your input to customize which keys will be backlit in this profile. Simply turn the backlight on or off for a specific key by pressing it while the lock lights are blinking. When you have it customized to your liking, press Fn + Print Screen again to save the profile. To switch back to the all keys lit mode press Fn + Insert. To enable the saved profile, press Fn + Delete. The brightness of the two ambient side lights can be adjusted using Fn + Pause. They also have three levels of brightness, but no pulse mode. Should you desire they can also be turned completely off. The Max Kyeboard Blackbird is available with three different types of Cherry MX switches: Blue (clicky), Brown (tactile) and Red (linear). The one I’m reviewing now came with Cherry MX Reds, a linear switch popular with the PC gaming crowd. Being a linear switch, the Cherry MX Red has no tactile bump or audible click upon actuation. It has a smooth press from the top of the keystroke all the way down, until bottoming out. MX Reds are a light switch with an actuation force of only 45g. Since they also have no feedback for key actuation they’re extremely easy to bottom out. Similar to a Cherry MX Brown, just without the small tactile bump featured on the Brown switch. They have no hysteresis, which is one of the main reasons they appeal to gamers. Linear switches are generally considered the best mechanical keyboard switch type for gaming, but that’s subjective and your own personal preferences may differ. Cherry makes a decent linear switch, but if you’ve ever used a linear Gateron switch you may be left a little disappointed. Compared to Gaterons, which are buttery smooth, Cherry MX linear switches feel a little scratchy. They can smooth out a little with time and use, but initially feel just a tad coarse. The Blackbird’s stock ABS keycaps in OEM profile are much better than the typical ones found on cheaper mechanical keyboards. They’re on the thicker side and have a premium feel. The plastic is clean and uniform with none of the imperfections often found on cheaply molded keycaps. They have a light matte texture that’s similar to the case, but less aggressive. The keycaps are doubleshot in construction with a translucent material used for the legends. This method produces high-contrast characters that won’t fade or wear away and allows the LED backlighting to shine through, illuminating the legend. I’m also happy with the font Max Keyboard has chosen for the legends. A fairly standard, easy to read typeface that doesn’t try to look “cool” and stand out, unlike many of the fonts printed on some of the gaming mechs I’ve recently reviewed. The Blackbird makes use of Cherry stabilizers on the larger keys to level the keycaps and insure a consistent keystroke. I didn’t notice any keycap shininess or wear after my time testing the Blackbird, but they are ABS so it would only be a matter of time before they start to become smoother and shiny. Overall these are some of the best stock ABS keycaps I’ve come across. The only improvement Max Keyboard could make would be an upgrade to PBT material. If you need a robust mechanical keyboard look no further. The Blackbird is one of the sturdiest mechanical keyboards I’ve owned. There’s practically no flexing or creaking when applying strong force to each end or pressing down on the edges of the case. It’s durable, mostly due to the fact it uses a steel backplate instead of aluminum. The top and bottom shells of the case are molded from dense plastic with a matte texture that doesn’t collect fingerprints. Just holding it in person you get an instant feeling of quality. Should easily withstand years of abuse. That ruggedness does have drawbacks. It’s heavy and thick. Not exactly a peripheral made for portability. I wouldn’t go as far to compare it to the IBM Model M, but anyone wanting a tough, well-built mechanical keyboard will be happy with the Blackbird’s build quality. The Max Keyboard Blackbird is a fantastic TKL mechanical keyboard with moderately thick doubleshot ABS keycaps, rigid steel backplate, authentic Cherry MX switches, attractive ambient side lighting, standard ANSI layout, braided cable, backlit keys, foam padded wrist wrest and a built-in USB hub. All those features come at a price, and it isn’t cheap. Even though the Cherry MX Red linear variant can be found for about $100, the suggest retail price is still upwards of $150 and that’s what you’ll pay for the tactile and clicky models. I think it’s worth it. The build quality feels similar to Filco and KUL mechanical keyboards, which are both high-end products with a premium price to match. You really do get what you pay for. Superb build quality, premium feel. Thick doubleshot ABS keycaps with a normal, visually appealing font used for the legends. Genuine Cherry MX Red linear switches. Includes a padded foam wrist rest. Completely standard ANSI layout with no odd sized keys. Unique ambient side lighting design adds visual flavor without being too over the top. Excellent rubber and flip-out feet that excel at keeping the keyboard in place. 2-port USB hub that doesn’t require a extra cable to be connected to your PC. Free of any garish branding, logos and badges. The suggested retail price is a bit high, but the Cherry MX Red version can be found for much cheaper. Cable is hardwired, so not user replaceable. No options for programmable or macro keys. Limited customization and backlight options. The main selling points of the Max Keyboard Blackbird are its robust build quality, genuine Cherry MX switches and unique visual appeal provided by the ambient side lighting. The perfect choice for a mechanical gaming keyboard without the BS “gamer” marketing hype. One of my personal favorites. 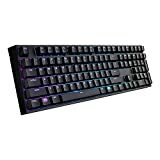 The Max Keyboard Blackbird TKL mechanical keyboard with Cherry MX Red switches is available from Amazon at the time of writing this review.